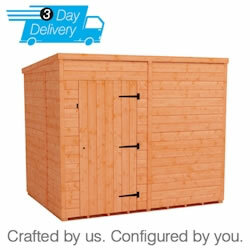 Our Express Sheds offer the same excellent quality of our standard sheds, delivered from our factory to your door in three working days or less! 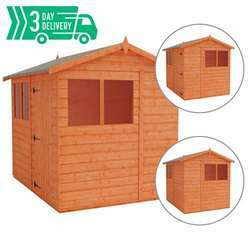 Our Express Sheds feature high grade, 12mm tongue and groove shiplap cladding with sturdy tongue and groove boards for the roof and floor. As always, delivery is completely FREE to postcodes within our standard area. 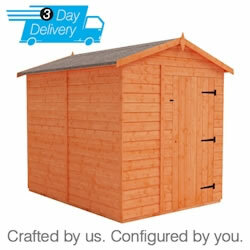 Find out more about our Express Sheds range. 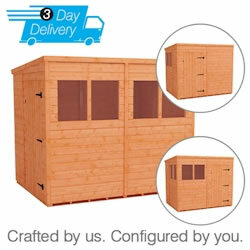 Express Sheds are perfect for when you need a shed, fast. Speed does not compromise quality, and you can rest assured that our Express Sheds are strong, secure and stylish garden buildings that are made to last. Our Flex range has been specially designed with versatility in mind. Modular panels give you the freedom to configure your building to your preference, choosing where to place the doors and windows. Whether you want a traditional apex building or prefer a more modern pent roof, we have a building to suit your needs. Our customer-favourite Tiger™ Flex Apex is now joined by the Tiger™ Flex Apex Windowless, the Tiger™ Flex Pent, and the Tiger™ Flex Pent Windowless.